Idealized food practices have changed, I explain in the introduction to a 2015 special issue (26.1) of the journal Utopian Studies. 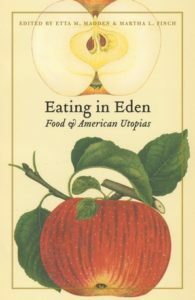 Since Eating in Eden: Food and American Utopias appeared, utopian foodways have turned to production that is better for sustaining the earth. In addition, food ideals are conveyed now through social media, a possibility that was in its infancy when Eating in Eden went to press. My introduction provides an overview to the collection, with specifics about the thirteen essays and book reviews within it. Co-edited with Timothy Miller and Lyman Tower Sargent, who are also contributors, the special issue examines utopian food practices that give attention to consumption and clean up as well as social exchange and spirituality.